One of my Bff’s is having a dinner party for her work friends tonight and I volunteered to make the dessert for her party as she is not one of that loves to spend time in the kitchen…other than putting a frozen TV dinner in the microwave. When I began to describe a few of the new recipes that I had found this season, she choose this one. It turned out just awesome. Combined the flavors of orange and raspberry. Mix above ingredients and bake according to directions on box for the 2 layer cake. But beat for 4 minutes instead of 2. The addition of the Dream Whip gives you a much fluffier cake layer. Blend the softened butter, cream cheese, zest and powdered sugar and beat until well combined and smooth. Place one cake layer on serving plate and spread 1/3 of the frosting. Spread the raspberry preserves over the frosting. Place 2nd layer on top of preserves. 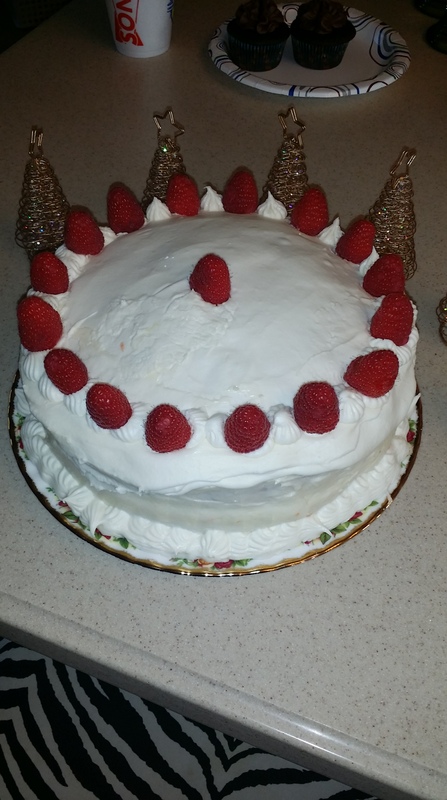 Frost sides and top with remaining frosting, (saving about 1/2 cup to decorate the top) Using your cake decorator, use the star tip and decorate top with stars to place fresh raspberries around the edge. Keep cake in fridge and take out about 30 min before serving.